A flat bicycle tire is one of the issues that often annoy cyclists. The only way you can deal with the situation is to get prepared with a good bike pump to help you inflate your bike’s tires any time they get flat. Thankfully, various types of bike pumps are available in the market today and getting one that suits your budget should not be hard. Some of the qualities you might consider when purchasing a pump include a reasonable PSI, a pressure gauge that helps you monitor the amount of pressure you are pumping into a flat tire, and an ergonomic design that makes your work easy and fast. Below is our pick of the best pumps that will make your cycling life easy. The Xtreme Air Bike Pump is a floor style pump that fits on most types of bicycle valve. It also comes with three easy-to-connect needles that can be used to inflate toys and travel pillows. Xtreme Air Bike Pump’s fiber-reinforced non-slip handle sits comfortably on your hands giving you the ability to inflate your tires effortlessly. It has a 100% lifetime money back guarantee. 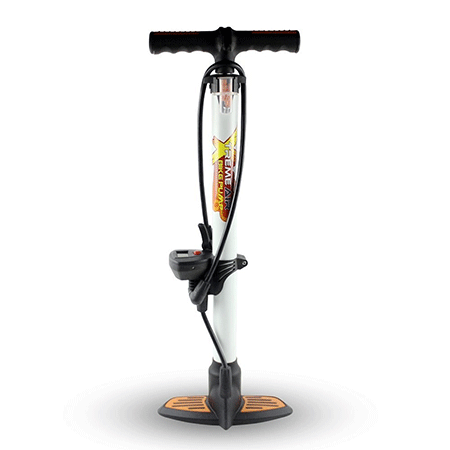 Extreme air bike pump has a broad base that offers optimal stability. It has a digital pressure monitor that helps you to pump the exact pressure required for your tire. The battery powered pressure gauge may not function when the battery drains. 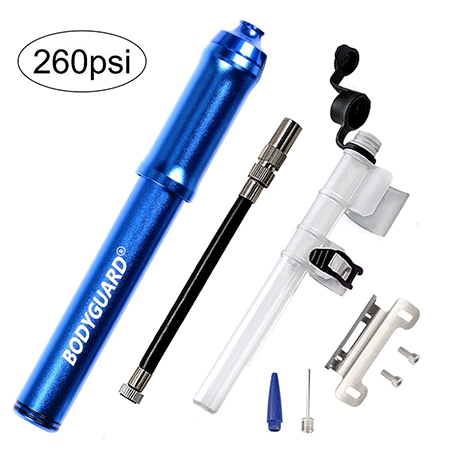 The Bodyguard Mini Bike pump comes in black, blue, and silver colors. Its 260 PSI pressure makes it an appropriate pump for bicycles like mountain bikes and children’s bikes. Bodyguard’s air hose will also fit tightly on your bike’s valve. It is made of an aluminum alloy; a material that lasts long. Bodyguard’s mini bike pump’s 5.6 Oz weight and compact size make it a portable device. It comes with a ball needle and balloon valve that will allow you to also inflate balls. Bodyguard mini bike pump does not come with user manual. 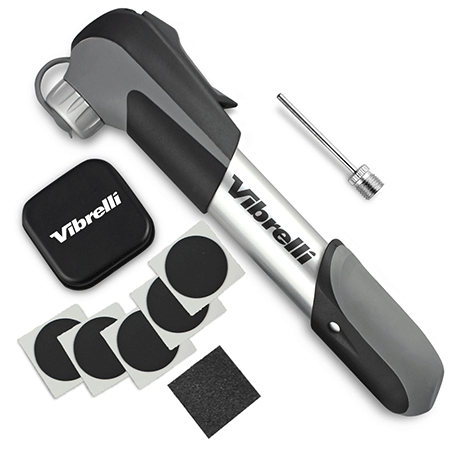 The mini bike pump takes long to inflate a flat tire. This bicycle pump comes in silver blue and red colors. It features a reversible Presta and Schrader valve attachment that fits onto most bike tube valves. The mini bike pump also comes with a mounting bracket that helps you attach it to your bike. It is a portable mini bike pump that weighs as little as 120g. 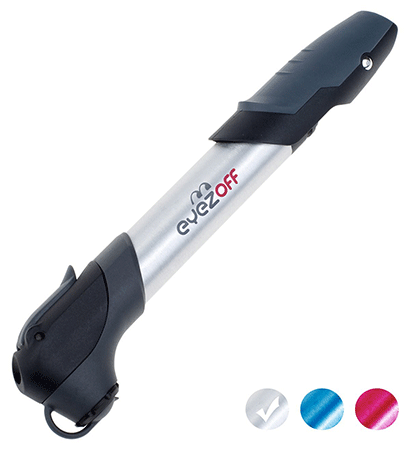 EyezOff Mini Bike Pump is affordable. It has a comfortable soft touch handle. EyezOff has a lower psi. Thus, it is not suitable for high-pressure tires. The bell air attack high volume pump features a wide barrel that pushes more air thus being able to inflate your flat bike tire quickly. Its reversible Schrader and Presta head can be used with bicycle types like mountain bikes, kid’s bikes, and Cruiser Mountains. Besides inflating bicycle tires, it also has a ball needle that lets you inflate balls and toys. It releases a high volume of air, hence suitable for high-pressure tires. Bell air’s bike pump lasts long. It’s a portable bike pump that can be attached to your bike or carried in a backpack. This bike pump lacks a pressure gauge to help you determine the pressure in your bike’s tire. 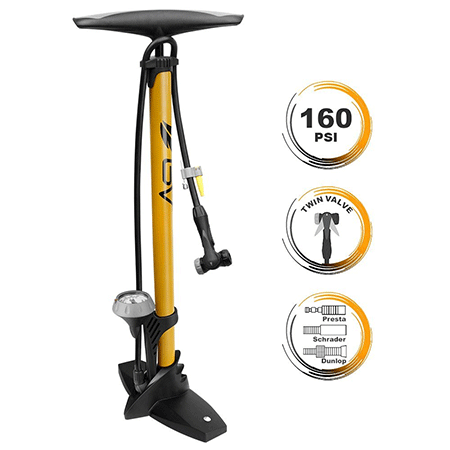 The BV Bicycle floor pump comes in yellow, silver, yellow, and black combo colors. This color variation lets you choose your favorite or one that matches the color of your bike. Its reversible Presta and Schrader valve tip and 160psi pressure make it a suitable pump for all bicycle models. Its ergonomic design with an easy to hold grip and a stable base make work easy and fast. BV bicycle floor pump’s pressure gauge lets you pump the exact amount required to inflate your tire. It comes with a ball needle to help you inflate balls and toys. 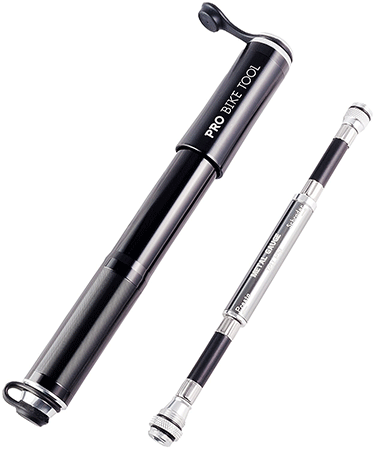 Pro Bike Pump comes in Black, Red, and Titanium colors. Its 120psi and the Presta and Schrader connection makes it suitable for all types of bicycles. Pro Bike Pump is made of an aluminum alloy that tolerates regular use. Furthermore, this bike pump has a large sized piston that inflates tires in up to 30% fewer strokes when compared to most pumps. It is a compact and lightweight bike pump. Pro Bike Pump comes with a mounting bracket and a Velcro strap that lets you attach it to your bike. Its pressure gauge helps you monitor the pressure. Pro Bike pump’s instruction manual is quite difficult to read or understand. Schwinn 5-in-1 floor pump features a large easy to read pressure gauge that lets you pump an appropriate amount of pressure into your bicycle’s tire. The pump is compatible with most bicycles and can be used with mountain bikes and other road bikes that use the Presta and Schrader valves. Its wide base offers you the stability you need when pumping. It can be used to inflate balls, toys, and travel pillows. Schwinn’s metallic body lasts long. Its high pressure of 140PSI makes it a good fit for tires that need high pressure. Schwinn’s standard package does not contain a ball needle. 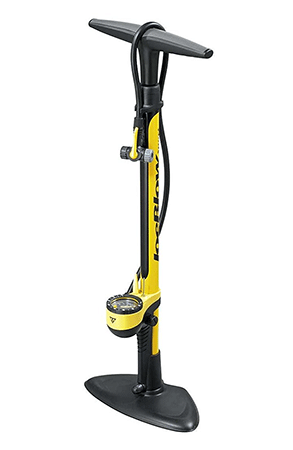 The Topeak Sports II Floor Pump is made of quality materials that are certified to last long. It features a 360-degree pivot that fits comfortably on most bicycle valves. Furthermore, it is made of steel; a material that lasts long. Its twin head is compatible with the Presta and Schrader valves used in most bike models. Its pressure gauge helps you monitor the pressure levels of your tires. Topeak Sports pump has oversized handles that provide a firm and comfortable grip. Its broad base provides you the stability you need when pumping. Topeak sports pump is expensive compared to most types of bike pumps. 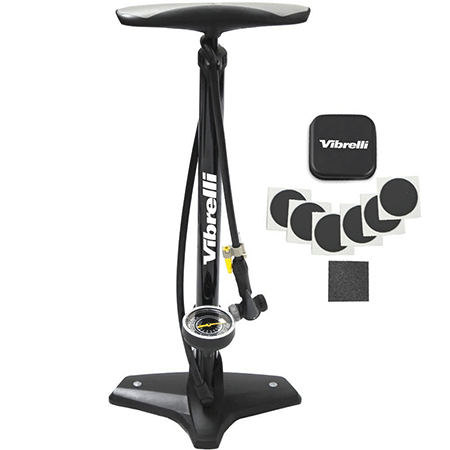 Vibrelli Performance Bike floor pump is a steel-made bike pump designed for bicycles with Presta and Schrader valves. Its standard package contains glueless emergency puncture kits that help you fix a puncture. The package also contains an inflation needle used to inflate sports balls and pool toys. The bike pump can release a pressure of up to 160PSI. Vibrelli floor pump is made from steel to last long. This mini bike pump is compatible with bicycles using the Presta and Schrader valves. Regardless of its compact size, this bike pump has a high pressure of 120PSI. You can, therefore, use it to inflate tires that require a high pressure. This bike pump comes with a puncture kit, mounting bracket, and a Velcro strap. It is a portable mini bike pump that can fit into a backpack or be mounted on the bike. It lacks a pressure gauge. The above review features some of the best bike pumps used by most cyclists. They are affordable and they are compatible with the Presta and Schrader valves. Besides inflating tires, you can also use most of them to inflate balls and pool toys. Our review helps you pick one that suits your need.